A new report has revealed the true state of homelessness in Victoria. Displayed as an interactive heat map, users can search by electorate to see those most affected by homelessness, as well as how different forms of homelessness (couchsurfing, rooming houses, rough sleeping and severe overcrowding) have taken hold throughout the State. Ten out of the top 20 worst metro electorates for homelessness are in the South/South-East metro electorates: Dandenong, Frankston, Narre Warren South, Keysborough, Mulgrave, Clarinda, Oakleigh, Caulfield, Prahran, and Albert Park. The regional Victorian electorates of Shepparton, Geelong and Ballarat (Wendouree) have a higher rate of homelessness than the median metro rate. 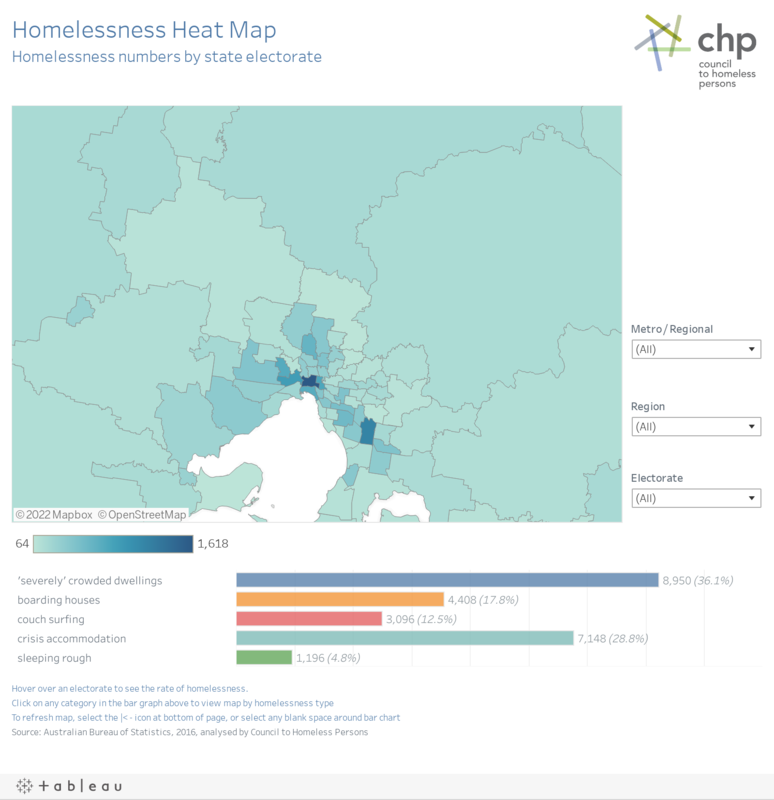 The map was released to coincide with the Victorian Homeless Election Platform, a ‘blueprint’ for ending homelessness in Victoria, released by peak body the Council to Homeless Persons (CHP). Housing: A boost of 3000 new social housing properties per year for 10 years, with 1500 being one and two-bedroom homes for singles, couples or small families. Rough sleeping: Providing dedicated housing stock and intensive support for rough sleepers, like they do in Finland. Indigenous homelessness: Expand homelessness service delivery in prevention, early intervention, and ongoing support capacity delivered by Aboriginal Community Controlled Organisations. Youth: Rent subsidies for young people leaving refuges, raising the age young people exit state or foster care from 18 to 21, programs to help homeless youth stay in education, and more youth refuges. VincentCare Victoria’s CEO John Blewonski said a State Government housing and homelessness strategy developed across departments and implemented through client-focused agencies is a must. He said while this State Government has gone some way to listening to the community and agencies on this issue but there is still a way to go. “Providing support to people in housing crisis and people who are homeless is vital; providing stable housing is a human right,” Mr Blewonski said. VincentCare Victoria is a leading provider of housing, homelessness and crisis support programs, and advocacy on behalf of Victoria's most marginalised. Visit the website to find out more about how VincentCare is targeting homelessness and disadvantage.